Storing gas power tools for an extended period of time it's important for making sure your tools are ready to go the following season. If you won't be using your chainsaw over the winter, follow these steps to properly winterize your chainsaw. There are a couple ways you can empty your fuel tank. Most fuel today has a short shelf like because it contains ethanol. Some high quality, high octane fuels or fuels treated with a treatment such as Star Tron Enzyme Treatment can be stored safely for up to 2 years, but generally speaking, you will want to remove the fuel both for safety reasons and because fuel can thicken over time, doing damage to your carburetor. Remove the fuel from your tank and add a small amount of high grade, ethanol free fuel, or fuel that has been treated with a fuel stabilizer back into your tank. Start the chainsaw 10 feet from where you were removing and adding fuel, and let it run until the engine stops. What's better than firing up a freshly cleaned chainsaw next season? Cleaning your chainsaw and all its components might not be entirely necessary, but it will ensure that your saw is ready to go next season. At the very least you will want to remove the bar and chain and wipe them down to prevent any rusting or corrosion. You will also want to wipe the bar and chain down with WD-40 or another rust preventing oil. Check out our chainsaw cleaning guide for more tips on getting your saw in top shape. Storing your saw in a dry place is crucial to keeping all of the components corrosion free. In addition to keeping moisture away from your saw, you don't want any dust or debris building up on your chainsaw throughout storage. If your chainsaw came with a case, store it in the case or find a relatively air tight container to put the saw in that will keep dust out. If you follow these steps, by the time next season rolls around, your chainsaw will be ready to go! 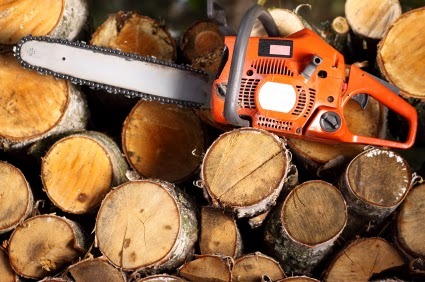 HLSupply.com supplies quality aftermarket chainsaw parts and supplies for a number of makes and models including Stihl, Husqvarna, Partner, and more.